This is our third house, strictly speaking not a house but a bungalow. 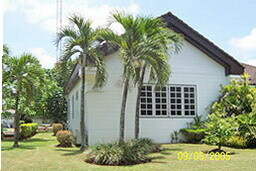 It is located 16 Kilometers north of Chiang Mai in the district of May Joe University. A map is available on this site, see Information Maps. The view is one quarter of the property and shows our bedroom. To the rear is the radio room with the antenna mast visible left corner. 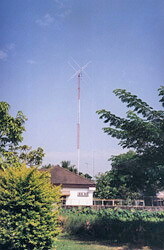 This is a picture of the antenna and tower taken from down the road. This picture has appeared in the RSGB DX column and at one time displayed on QRZ.com. This picture is now replaced by one of me in the radio room.